Music and Architecture have many things in common – rhythm, texture, harmony, proportion, and dynamics. We have all seen how architecture can inspire, elicit emotion, and heal; so, it is no wonder that music can do the same. For most of us we probably see architecture as a big part of our lives and although we may not realize it, music is too. 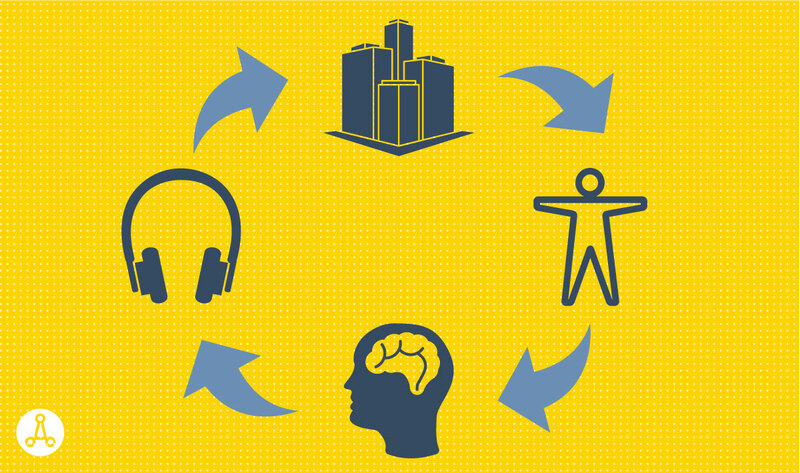 Music can affect our moods, memory, performance, and wellbeing. As Plato said, “Music is a moral law. It gives soul to the universe, wings to the mind, flight to the imagination, and charm and gaiety to life and to everything.” Research has proven that children who learn a musical instrument often do better academically, are more focused, and have greater self-esteem. Why is this? Why are we so drawn to music? We connect with music in many ways. Our hearts can sync to the rhythm of a song; the tone or pitch of a song establishes connections to our brains. Our brains will start to produce serotonin and dopamine whenever we hear joyful, upbeat, and happy-feeling music, which in turn makes us feel happy. The same type of reaction happens within our brains when we listen to soothing music and loud or angry music; any type of music can elicit strong emotions and sometimes more than one. When listening to music many parts of our brain are being stimulated; areas that control movement, planning, attention, and memory. The University of Windsor Canada conducted a study which proved that “people working in a highly creative environment worked more effectively and faster when listening to music. They were more perceptive to what was going on around them, more highly engaged and curious. Conversely, performance then dropped if the music was turned off.” A study conducted by Mindlab in the UK yielded similar results. Most of us have probably experienced first-hand the power of music, to help us focus in studio and block out other distractors, but did you know that certain types of music are more compatible with specific types of activities? Classical Music: If you are doing work with numbers or which requires a lot of attention to detail. Pop music: For data entry or working to deadlines. It speeds up the rate of work and helps to reduce mistakes. Ambient music: What I call background music, has been shown to be THE best for accuracy if you’re into solving equations. Dance music: Problem solving or proofreading. This genre was linked to the highest overall accuracy and fastest performance. There are variable degrees of effectiveness or no effects at all reported for music therapy. There needs to be more rigorous studies over the effects of medical music therapy. The music therapy studies conducted often lack large sample sizes, follow-up assessments of long-term effects, lack of attention to potential significant moderator variables, and insufficient attention to the cost-effectiveness and safety. Along with the lack of evidence-based studies, another big challenge for music therapy is understanding the meaning of musical behavior both from a psychological perspective and a physiological. There are still plenty of questions to be answered to determine whether music therapy is a successful means of treatment. However, with many students using and seeing the power that music can have within their daily lives, hopefully these questions will be answered in the near future. The AIAS Health and Wellness Committee has curated a Spotify Playlist to help you get your own music therapy playlist started or find some new songs to add to your playlist. Take a listen!